The region you are located in is determined automatically. There are two ways you can find out the forecast for your exact location. 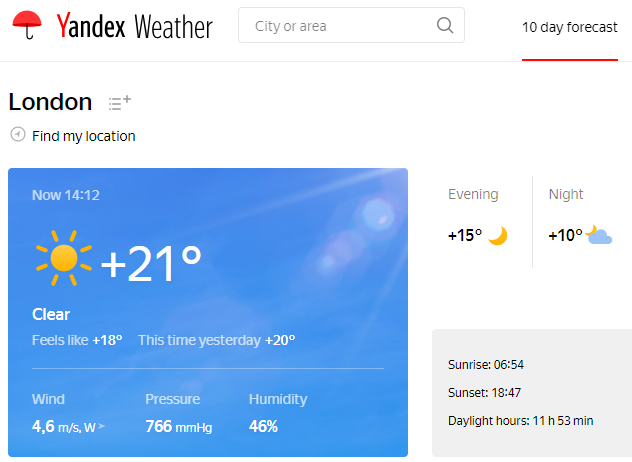 On the Yandex.Weather homepage, click Find my location under the city name. The service will determine your exact coordinates and show the forecast for that location. Attention. If you are using the location function for the first time, the browser will ask for permission to determine your location for the website yandex.com/weather. Allow it to determine your location: Yandex.Weather will use this data to make the most accurate weather forecast possible. Enter the name of the city on the settings page. The city that you have manually selected is saved in cookies. If you always see a different city instead of the one selected manually, this means that the cookies are cleared from your browser. Allow saving cookies in the browser settings. You can find out how to do this in Accepting cookies. For more information about how websites determine your location, see Your location. Enter the name of the location and click Find. At the bottom of the Yandex.Weather homepage, select one of the suggested cities. Tip. To select a city in a different country, locate Other cities, click the link Weather in the world, select the country, and then select the city from the list.